Everyone knows The Mountains to Sound Greenway has some of the best hiking trails in this area. A rainy day hike to Granite Lakes a couple of weekends ago was no exception. With abundant hiking in the nearby Alpine Lakes Wilderness (the closest wilderness area to any major metropolitan area in the country! 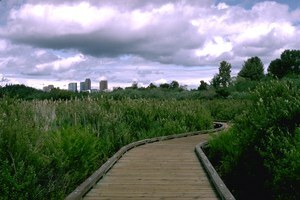 ), it can be easy to overlook the wonderful trails in our neighborhood parks. Even the smallest urban trails can be places to get away from the hustle and bustle of daily life for reflection! Some of them, like the Mercer Slough Heritage Trail, can give us a peek into our history. Others, such as Seward Park’s interior trails, are wooded enough that we can immerse ourselves in nature, forgetting the city is nearby. How can those who choose not to, or can’t afford to, own a car get to these urban oases? Walking and biking are excellent options depending on your physical ability level and your proximity to the park. As far as transit is concerned, at least in the City of Seattle (we were asked by SDOT –see The Process* below for more information), trails are very well served by transit. In Seattle there are 47 trails within a ½ mile of transit, 40 within a ¼ mile, and 34 that are adjacent! For more information see table 1. For suggestions including hikes outside of Seattle accessible by bus see Seattle Metro Bus Hiking. Happy hiking! A few weeks ago we received a request from the Seattle Department of Transportation locations of the trailheads in Seattle that are served by Metro. It so happened that we had no idea, but we thought it was a question worth researching so I set out to find the answers. The list of trails within Seattle was combined from a search from Seattle Parks and Recreation and other trails that were left of the Parks and Recreation list for whatever reason (the famous Greenlake loop for example!). To figure out whether these trails are served by Metro I used ½ mile, ¼ mile, and adjacent standards as there is no consensus on how far people will walk to a park. Then it was simply a matter of plugging in and verifying the park addresses, looking for adjacent bus stops on Google Maps, and using Metro Trip Planner to test out walking distance. This entry was posted in Mountains to Sound Greenway Trust on January 5, 2013 by gordonpadelford.